8 pp. Roman, 187 pp. 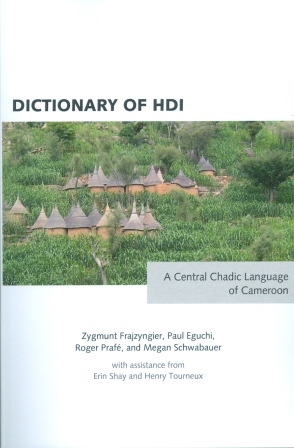 Hdi (gwáɗ-á xdí ‘anguage of Hdi’ or simply xdí ‘in Hdi’) is a Central Chadic language spoken in the Far North Province of Cameroon, the main town where the language is spoken being Tourou right on the border between Cameroon and Nigeria. The estimates of the number of speakers of Hdi range between 10,000 and 29,000 (www.ethnologue.com). The dictionary is primarily based on fieldwork by Zygmunt Frajzyngier that started in 1991 and furthermore incorporates data from Paul Eguchi’s Matériaux pour servir à l'étude de la langue hidé: Vocabulaire (1971). The book consists of four parts. The first part is a grammatical sketch the purpose of which is to present, in an abbreviated form of about 50 pages, the main formal coding means and functions encoded in the grammatical system of the language. The second part is the Hdi-English-French dictionary, which contains the respective lexical items followed by the indicators of their categoriality, translation into English, translation into French, and examples of their use. Some of the nominal and verbal entries include an explanation of customs, ceremonies, and practices in which a given activity, as represented by a verb, or a given entity, as represented by a noun, plays a role. The third and fourth parts comprise an English-Hdi-French as well as a French-Hdi-English index. The inclusion of both French and English in the indexes is justified by the fact that some speakers of Hdi live in Nigeria, where English is one of the main languages, while the majority of Hdi speakers live in Cameroon, where French is one of the official languages. Thus, it is hoped that the dictionary might assist Hdi speakers in the acquisition of English and French. The dictionary can be used in conjunction with the Lexus database (http://lux17.mpi.nl/lex/lexus/index.html), where all the entries and examples from the present dictionary are accompanied by sound recordings, and certain entries pertaining to flora and house implements are illustrated by photographs. We should be grateful to the authors for this valuable dictionary, which will enhance the documentation of a rather minority Central Chadic language, considering the fact that H. Ekkehard Wolff has recently published The Lamang Language and Dictionary (Köln: Rüdiger Köppe 2015), a language very close to Hdi. [...] While this is certainly not the definitive dictionary of Hdi, it is nonetheless one big step forward on the way of exploring this very interesting language.